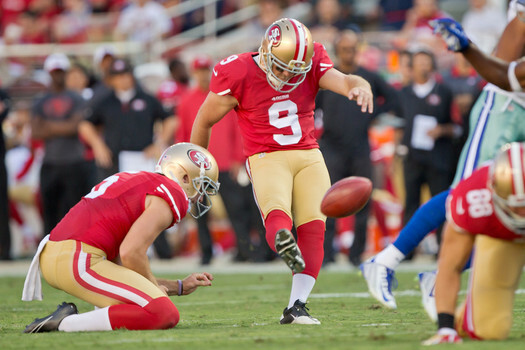 49ers place kicker Phil Dawson has been named the 2015 Bill Walsh Award winner. The award, with voted tabulated by the teams coaching staff, is handed out annually to San Francisco's most valuable player—Dawson became the first 49ers kicker to win the award since 2005, when Joe Nedney was co-MVP with linebacker Derek Smith. Dawson, who is scheduled to become a free agent this offseason, had an excellent year for the 49ers. He made 24 of 27 field goals, two of his misses were blocked kicks. He converted 20 of 21 extra point attempts as well. Thursday, Dawson reacted to the honor in a statement released through the 49ers website. “Any award with Bill Walsh’s name attached to it is a big deal,” Dawson said in the statement. “In my three years in San Francisco, I’ve grown to learn even more about coach Walsh and respect him all the more. So that’s a tremendous honor in and of itself. But, then to consider that the coaches were the ones voting on this, just puts it over the top. Wide receiver Anquan Boldin, who is also scheduled for free agency this year at age 35, received this year's Len Eshmont Award. Considered the most prestigious honor, the award is handed out to the player who best exemplifies inspiration and courage—it is voted on by the players. Additionally, Boldin was San Francisco's nominee for this year's Walter Payton Man of the Year Award, for his commitment to the community and philanthropy. Left tackle Joe Staley was honored as this year's winner of the Bobb McKittrick Award winner for best representing the courage, intensity and sacrifice displayed by the long-time 49ers offensive line coach. Linebacker NaVorro Bowman —who led the league in tackles his first season back from knee surgery— was honored with Ed Block Courage Award. The award is handed out by all 32 NFL teams, and is presented to the player who best exemplifies a commitment to sportsmanship and courage. A banquet is held each year for the 32 players honored with the award in Baltimore, Maryland.